From time to time, I come across having to burn an ISO onsite. I usually carry with me an external hard drive on which I have a few essential ISO’s, such as Ubuntu, UBCD or GParted. Now, while I have software to burn ISO’s on my computer, I don’t always bring my computer with me when going to see a customer. Luckily, there is a nifty little app to help me burn the discs I might need. 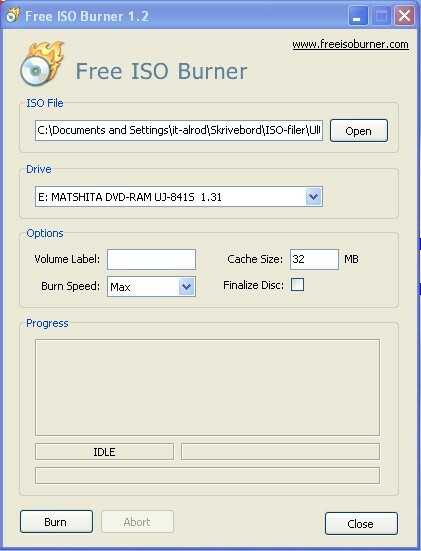 The program is called “Free ISO Burner“, and it does exactly what it is meant to do, no more, no less. There are two advantages to this program. The first is the fact that it takes up less than one megabyte of storage. The second is that it runs, simply and smoothly, without installation. These two features means it’s one of the many programs I always have with me on a memorystick.